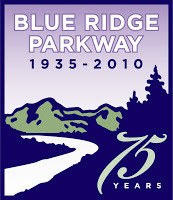 This year marks the 75th anniversary of the Blue Ridge Parkway, a 469-mile scenic route from Shenandoah National Park in Virginia, southwest through the North Carolina mountains to the Smoky Mountains National Park. In our area, the nearest section of the Parkway heads from the Grandfather Mountain area northeast of the Inn on Mill Creek, along the Black Mountains and Mt. Mitchell (the highest peak east of the Mississippi), around Asheville and on to Mt. Pisgah to the southwest. It’s a wonderful road to take for views of the mountains via picturesque overlooks, nice hiking (and a picnic lunch), walking among wildflowers galore, and fantastic birding opportunities. From the Inn on Mill Creek, you can reach the Blue Ridge Parkway by heading west to I-40 exit 55 in Asheville (best for going south on the Parkway), or through Old Fort to the east on Highway 70 to Route 80 (curvy!) or Highway 221 North (best for going north on the Parkway). To commemorate and bring awareness to this year’s special anniversary of the Parkway, the BRP75 folks are highlighting several events taking place in our area, including the North Carolina Gold Festival in Marion and Pioneer Day in Old Fort in April, and the Rhododendron Show in Asheville, Railroad Day in Old Fort and Naturalist Weekend at Grandfather Mountain in May. You can find more events at www.brp75.org.